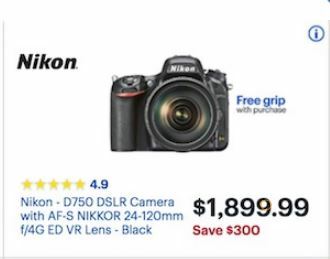 Find Nikon camera deals for Black Friday and Cyber Monday 2019. We search camera manufacturers and retailers like Amazon and B&H Photo to help you discover the best deals and discounts on professional and amateur Nikon cameras. 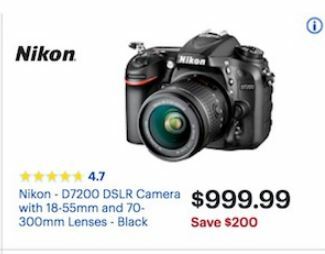 Whether you are looking for the top of the line D850, the mid-level D7500, or the entry level D3400, we can help you find a great price on a new or refurbished camera over Black Friday 2019. 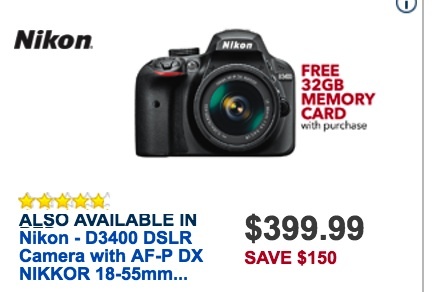 CLICK HERE to shop the Best Buy Nikon deals. The D3400 Double Zoom Lens Kit includes the AF-P DX NIKKOR 18-55 mm f/3.5-5.6G VR lens, AF-P DX NIKKOR 70-300mm f/4.5-6.4G ED telephoto zoom lens, travel case and online educational class. 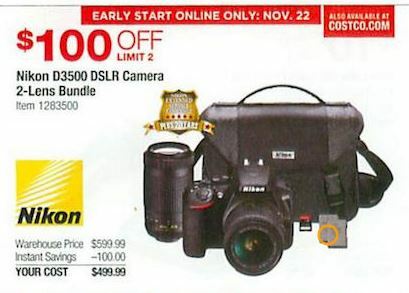 Was $899.95, now $499.95 at Nikon after $400 in instant savings. The other bundled option for this Nikon camera is the D3400 18-55 VR Kit with the AF-P DX NiIKKOR 18-55mm f/3.5-5.6G VR lens. 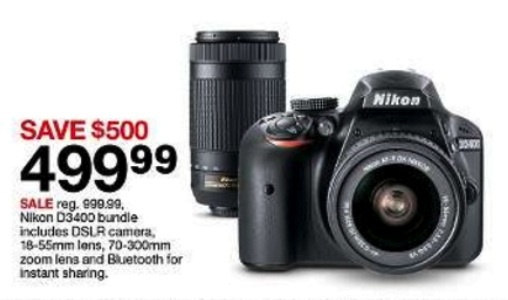 Was $549.95, now $399.95 at Nikon after $150 in instant savings. These deals are both available at Best Buy for just 4 cents more (minus the online educational class, we presume). Best Buy will throw in a free 32 GB memory card. The top bundle is also available at Target, but they don’t say that the case is included and aren’t offering a free memory card like Best Buy. This kit will be $550 off its regular price of $1549.95. It includes the AF-P DX NIKKOR 18-55mm f/3.5-5.6G VR lens, AF-P DX NIKKOR 70-300mm f/4.5-6.3G ED telephoto zoom lens, travel case and online educational class. The Body only will be $799.95 (after $300 in instant savings from the original price of $1099.95). 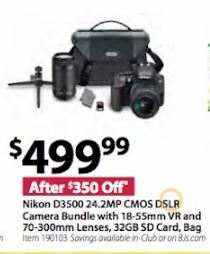 Nikon D5600 – $50 in instant savings off the body (only) or the kit. Sale prices of $649.95 and $749.95 respectively. 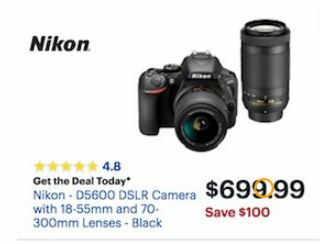 Nikon D7500 – $200 or $470 in instant savings off the bundles. The Kit with AF-S DX NIKKOR 18-140mm f/3.5-5.6G ED VR lens will be at a sale price of $1549.95. The Kit with Nikkor 16-80mm f/2.8-4E ED VR lens is $1849.95. There are also savings on some of the higher priced cameras. 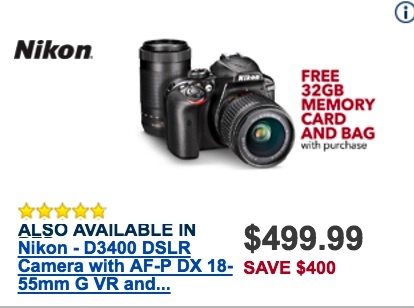 D750 – Save up to $1,585. The sale price is $1999.95 on the AF-S NIKKOR 24-120mm f/4G ED VR lens kit with multi-battery power pack. The body only is $1499.95 (after instant savings of $985). 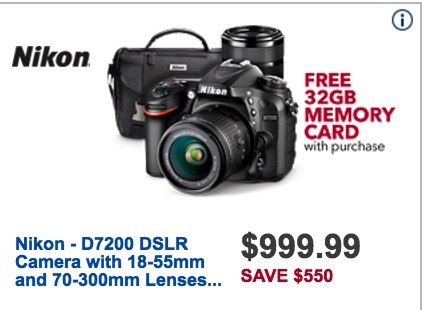 D500 – Save up to $1,119.95. The sale price is $2399.95 after instant savings on the bundle with multi-battery power pack and AF-S DX NIKKOR 16-80mm f/2.8-4E ED VR lens kit. Body only is on sale for $1799.95 (after instant savings of $649.95). Nikon D850 – Nikon’s top DSLR with a 45.7 megapixel full-frame camera and 4k video. Nikon D810 – A 36.3 megapixel full-frame camera with 1080p video capability. Nikon D750 – A full-frame DSLR released in 2014 with 24.3 megapixel resolution that provides a mid-level option for upgrading photography enthusiasts. Nikon D5 – A 20 megapixel full frame with 4K video that excels at shooting moving options with its autofocus system and 12 fps. Nikon D500 – The flagship DX camera for fast action shots and wildlife scenes with enough power to become your favorite travel companion. Nikon D7500 The D7500 is the 20.9 megapixel DX camera at the top of this enthusiast camera series with a new sensor and image processor. The D7200 and the D7100 are older versions for the enthusiast looking for a lower price point to make an upgrade to this amazing series. Nikon D5600 – A lightweight, mid-level 24.2 megapixel DSLR with the power to serve the needs of both beginners and experienced photographers. The D5500 is the older version by a year and doesn’t have bluetooth or wireless NFC connection. Nikon D3400 – A lightweight, interchangeable lens entry level DSLR for amateur photography. The D3400 is update to the D3300 which is still on the market. This is the Nikon mirrorless camera line. Nikon 1 V3 – The third generation premium camera in the Nikon 1 series. Nikon 1 J5 – A smaller version of the AW1 with 1200 fps high-speed video and 21 MP photos that was released in 2015. It has built-in wireless. It was released in 2015 and replaced the Nikon 1 J4. Nikon 1 AW1 – A 14 MP camera released in 2013. Continuous shooting at 60 fps. It has a weather sealed body and built-in GPS. Nikon KeyMission 360 – Capture 360 videos in 4K Ultra HD or 23.9 MP photos. SnapBridge integration for real-time wireless sharing. The camera is waterproof, shockproof and freezeproof with no additional housing. Nikon KeyMission 170 – Action camera with 170 degree first person point of view. Record still images or 4K Ultra HD video. Waterproof (10m), shockproof (2m), and freezeproof. Over 10 mounting accessories available. KeyMission 80 – A lightweight and wearable camera for capturing 12-megapixel photos or recording 1080p video outdoors. The Nikon COOLPIX cameras provide a series of easy to use digital cameras for the family or amateur photographer with a range of needs. Cameras are classified in the A Series, the AW All-Weather waterproof/rugged series, the Performance Series, the Life Series, and the Style Series. From the Coolpix W300 (waterproof action camera capturing 16 MP photos and 4K Ultra HD video) to the AW130 (waterproof to 100 feet deep!) to the incredible telephoto lens on the P900 83x (2000mm equivalent) optical zoom, we’ll be following the great black friday deals on these Nikon Cameras.